A new kind of bank is on its way. 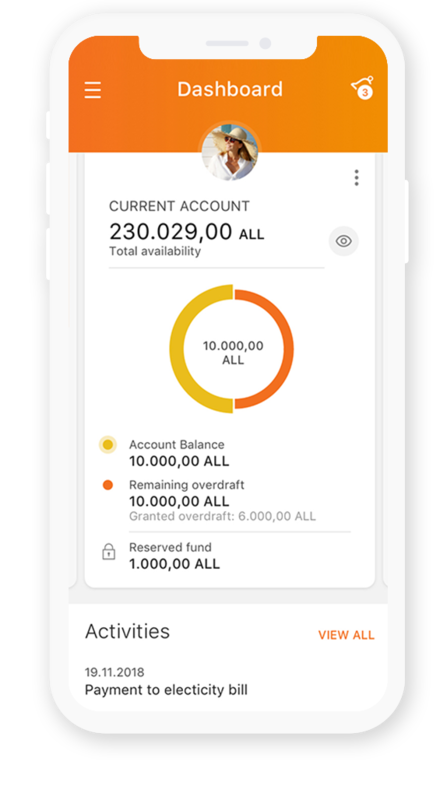 A bank always connected to you, with a suite of powerful tools and apps that allow you to manage your bank account, in a very simple way, and to build your future. All your finances are at hand: use the APP to manage your bank account. The 24hours loan gives you a chance to cover your personal needs very quickly, up to 600.000 lek. Discover how to achieve your goals right now! Let’s take advantage of the newest term deposit at the interest rate of 3.2% for 5 years. The world’s most popular cards. A wide range of products and services that make payments safer, simpler and smarter, and helps you manage everything from purchasing to getting paid.